Virginia Court Overturns Order That Restored Voting Rights To Felons : The Two-Way The state Supreme Court said Gov. Terry McAuliffe doesn't have the authority to grant voting rights to felons through a blanket order. 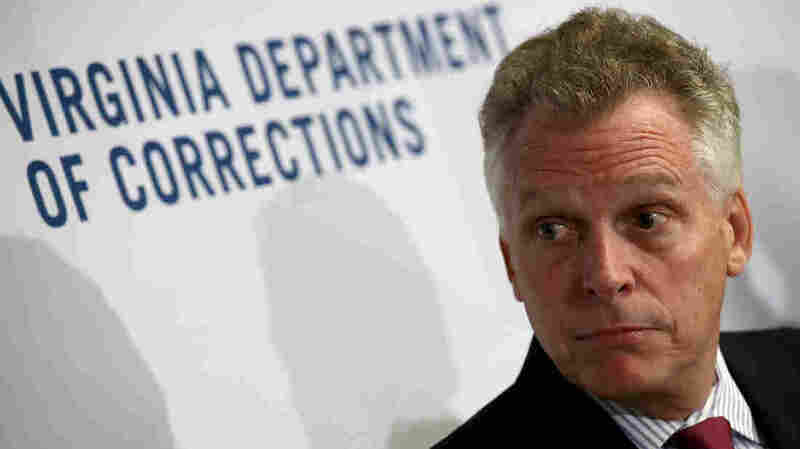 McAuliffe's action this spring affected 206,000 ex-offenders. The Virginia Supreme Court has ruled that Gov. Terry McAuliffe doesn't have the authority for a blanket restoration of voting rights to the state's felons. In a 4-3 ruling, the state's justices said under the state constitution, McAuliffe didn't have the authority for such a proclamation. "Never before have any of the prior 71 Virginia Governors issued a clemency order of any kind — including pardons, reprieves, commutations, and restoration orders — to a class of unnamed felons without regard for the nature of the crimes or any other individual circumstances relevant to the request," the majority wrote. "To be sure, no Governor of this Commonwealth, until now, has even suggested that such a power exists. And the only Governors who have seriously considered the question concluded that no such power exists." The court's ruling calls for state registrars to cancel the voter registration of all felons who registered to vote under McAuliffe's order. "I will expeditiously sign nearly 13,000 individual orders to restore the fundamental rights of the citizens who have had their rights restored and registered to vote," he said. "And I will continue to sign orders until I have completed restoration for all 200,000 Virginians." He called the lawsuit against him an "overtly political action," and said the court's ruling "has placed Virginia as an outlier in the struggle for civil and human rights." Under McAuliffe's order, the restoration of rights only extended to felons who have finished serving their terms — anyone in prison, or on supervised probation or parole, was still barred from voting. The order also granted felons the right to serve on juries and become a notary. "As of 2010, the most recent year for which data are available, Virginia had one of the highest levels in the nation of people who could not vote because of felony convictions: 7.3 percent, according to the U.S. Sentencing Project, a nonprofit that advocates for sentencing reforms. "However, since then, several thousand felons have already been added to voter rolls. Republican Gov. Bob McDonnell in 2013 issued an executive order making it easier for nonviolent felons to regain their voting rights. McAuliffe's office also estimates that he had restored voting rights to an additional 18,000 people prior to today's move." "I mean, they've served their time. They're done with the system," McAuliffe told NPR in an interview. "Why should we deny them the right to vote? "People make mistakes in life. You shouldn't have to live with that for the rest of your life. I believe in redemption. I'm an Irish Catholic, and I just think it's the right thing to do." But, as NPR's Pam Fessler reported earlier this month, Virginia Republicans said McAuliffe only has the authority to restore voting rights on a case-by-case basis. They argued that restoring rights individually allowed an ex-offender's crime can be taken into consideration. "Republicans suspect the real motive for McAuliffe's order is political," Pam reported. "The governor is a close ally of Democratic presidential candidate Hillary Clinton, who could benefit from more African-American voters if the race in Virginia is tight. McAuliffe denied that was his reason for issuing the order." Pam spoke to a felon, released from prison just over a month ago, who said he welcomed the governor's stance on felon voting rights and looked forward to registering once he was off parole. "It means you count," Anthony Puryear said.